Holy cow that’s the most technical article about camera sensors written by somebody with far to little knowledge about it I have ever read. Agree. At this level Wikipedia is better. Samsung ended up reducing their flagship phone’s cameras to sixteen megapixels for reasons we’ll discuss, then doesn’t discuss it? “Threshold to trigger the pixels” – complete BS, as you do not want a 1 bit black white picture. It’s analog. And raising the ISO setting has nothing to do with power consumption. This is just ordinary thermal and other noise, if you raise the gain you also amplify the noise. And of course the limits of pixel density are also quantum effects, limiting the minimum size of sensors or pixels. As light consists of photons – quants – which correspond to a finite wavelength. Not even mentioning the optics. Putting a huge megapixel sensor behind cheap glass will just result in higher-resolution blurry pictures. Match the sensor resolution to the resolution of the images that the glass can actually make! Well, higher resolution blurry pictures can be deconvolved. So, THAT’S what I did wrong! Thanks! I believe this is a big factor with phone cameras stabilizing at 15-20MPix. Regardless of sensor quality and CMOS noise, you’re still limited by the resolving power of the optics, which in turn is limited by the aperture. the ‘amplifier’ on a cmos takes up valuable pixel space, up to a certain size ccd will ‘perform better’ if you can find any. of course when back lapping became a thing this all went up in the air. pixel count might have been the yardstick for digital cameras but certainly the competing factor for mobile phones was sensitivity, if a sensor could produce a decent image in a dimly lit pub or nightclub on a Saturday night out it was a winner. thermal noise is certainly a factor but talking pixel size photon shot noise is the real killer. No mention of the fact that pixel density cannot be smaller then a wave length for the current filtering mechanism to function. No discussion about how a series of red, blue, and green pixels are organized. No discussion of the resampling used to convert from discrete RGB pixels to a pixel that has all colors included. No discussion on how the physical limits based on the filter construction are driving to fix optics over pixel count. No discussion on why the transistor size is much larger in CMOS imagers than memory or CPUs because the size is constrained by optical physics not chemical physics. This is a slap dash article at best. “Pixel density cannot be smaller then a wave length for the current filtering mechanism to function” is not technically true. Well, sure.. you CAN have pixels smaller than the wavelength.. but you actually loose resolution because of diffraction effects..
That good ‘ol PSF sure is a pain..
Not so. You can account for some of these things, to a point. The point spread function is a bit more malleable than most people might think. That is what books are fo.. er .. the Internet is for. Maybe that’s what killed them. Camera overkill. Nah, Microsoft did. The Nokia Lumia 1020 was a great phone crippled by the Windows Phone 8 OS and only having a dual core CPU. The camera was great. The sensor is about 1/3 of a square meter. The camera takes up about 5 square meters of floorspace. This article was not well researched or fact checked. 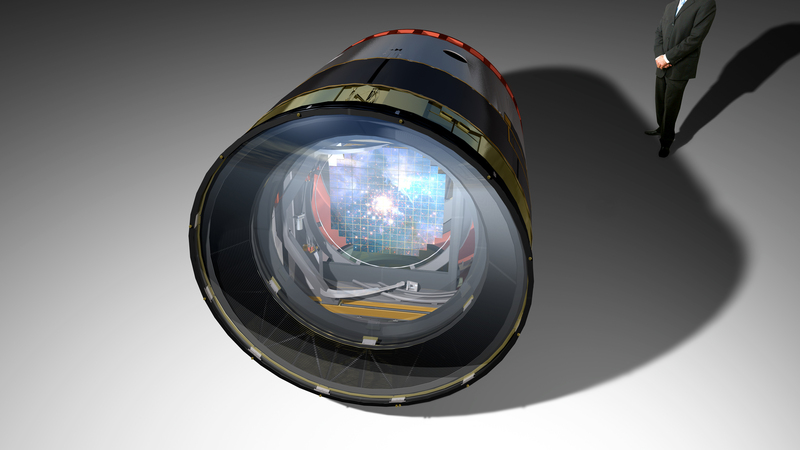 It contains a giant imaging sensor created by combining 189 individual CCD sensors. It will not be a single sensor. Will save 6 petabytes of data per year though. Do they put those petabytes into a petafile? Was wondering about that. CMOS sensors are not more accurate that CCD and certainly this not because they have an amplifier for each pixel. The opposite is true. In applications where quantification is a real requirement CCD is still the preferred sensor because of its linearity. All you have to do is normalize for Qe across the spectrum and keep the exposure such that the photon count is within the full-well capacity of the sensor. Any non linearity in the individual “pixel amplifiers” would result in non linearity in the final measurements. Combine this with the temporal complexity added by the rolling shutter most CMOS cameras operate with compared to the global shutter common in CCD sensors and you got another reason to avoid them. In astronomy it is common to actively cool the sensor to reduce noise. In the diagram, the camera sensors are in a cryostat. I’m sorry but this entire article about camera sensors is just false, CCD is in fact better than cmos for photographic images, cmos is right at its door step though. The whole min voltage to trigger is ISO is false. I feel like your just putting out an an article to be putting out an article. Stick to what you know, don’t create fluff to be more of a writer. Subjectively, most of us here are tech heads and not general public who does not want or need the fluff, I rather read a reference manual than the marketing flyer for a device. Stop being the marketing flyer. Yes. This is what I recall. CCD is much better. Bucket brigade. Analog. Etc. This article is way off. Shame on Hackaday for letting this go through. Where’s the editor? – expunge your text from movies cheap sci-fi INSPIRED “Like any Moore’s Law-inspired race,” fantasy. Sony just announced a 3 layer sensor (21.2 effective megapixel) with builtin buffer for smartphones that can do 1000FPS at HD resolution and also does HDR , so the race is not over by far. Interestingly the agreed interface standard for phones don’t allow data to be read that fast so the buffer just stores the data in between. Because of that readout limit though the practical effect is video @ 3.840 × 2.160 with 60FPS and in full HD with 240 FPS. They point out the high speed will prevent rolling shutter a good bit I understand. No I don’t work for Sony, in fact I boycott Sony products, but parts are parts eh. It look like it’s not the standard that limit the data readout speed. Standard mentioned was the MIPI alliance standard. Mind you the problem here is that the device makers probably just want something they can select and plug in so the sensor people have to design around that expectation I expect. Parts are parts but some parts are easier to use. Looking at you, memory stick. Apart from Sony making even more money, is there a point to Memory Sticks? Compared to SD Card and the rest? I would not say that CCD have been relegated to specialty applications. Fujifilm has 16 megapixel CCD sensors in consumer cameras (S8600).